FINALLY one I recognize at first glance! 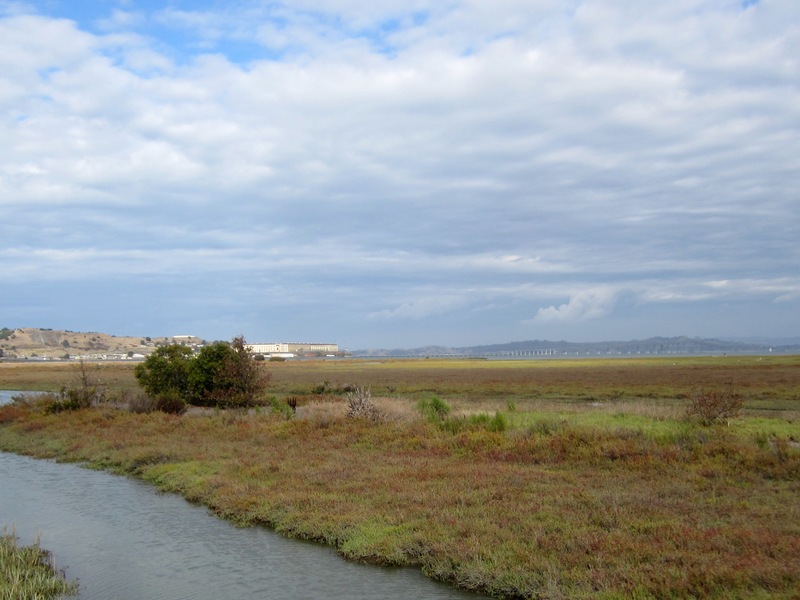 I can’t pinpoint the exact location (Google Street View is limited in the marshy/industrial areas by the Bay), but I could drive there on my way home from work. The yellow building is San Quentin Prison. Reminded me of Sète, on the southern French coast. Took a look at a couple of photos and … it’s not. Probably nearby, though! Penzance, England. Looking eastward. I don’t think it’s fair to research these. Classic VFYW: at first glance, impossible. Then, I find one clue to substantially narrow the range of my search and feel like it is within my grasp. Four hours later, it once again seems impossible. This week’s photo really fascinates me, though I have no idea where it is, except that it’s someplace in Britain or Ireland. That’s easy enough to tell because of the double, yellow no-parking lines painted on the street, the stonework in the wall, and the fact that this place looks rather chilly. What is that white, round building anyway? A lifeguard station? Really? An old bunker for observing Nazi planes? (That would explain the observation platform on top.) What about that thing in the ocean in the right-hand side of the picture, between the rock and the lamppost – what is that? Is it really attached by a line to the aluminum pole just to the left of the lamppost or am I seeing things? If this really is somewhere in Britain or Ireland, why is the hillside on the left so devoid of vegetation? I could go on and on. I’m really looking forward to finding out at least some of the answers to these questions. Stalwart folks enjoying the beach in cold weather, the double line, and the kerbstones scream British Isles. The color and shape of the houses is more Ireland than England, I’m thinking. Sandy beach AND rocky shore suggests north. The shadow of the building suggests east/northeast coast. No scraggly palm trees, so not Man. Googling “cement blue bench” and “UK promenade light post” returns nothing helpful. Might be Cornwall or Wales or Scotland too. But I can’t find it so I’m hoping for proximity here. Bangor, Northern Ireland, UK? On the “Coffee Difficulty Scale” (the temperature of the coffee upon getting the answer corresponds to the difficulty of the window), this one scores Lukewarm. Now the only question is, do I stick this last half cup of coffee in the microwave, or just down it and get on with my yardwork? My 9-year-old son is now in the game (and playing Geoguessr on the rare occasions he’s allowed on the computer) and will soon be an force to be reckoned with. He got half way around the coast of Ireland from Dublin before I found a tipoff image under “Irish coastal towns.” Two minutes more and he would have beaten me to it. Attached is the contest picture with labels for features in the scenery and directions to the statute of the late actor Richard Harris playing squash and one of the murals of Che Guevara around the town. One of the features in the picture is George’s Head, the 100-foot cliff rising up from the bay on the right. It was off George’s Head that John Francis O’Reilly claimed to have ditched the wireless set provided by his German handlers of the Sicherheitsdienst (a/k/a/ “SD”) before turning himself in to the gardaí on the night of 16 December 1943. O’Reilly parachuted (out of a Heinkel He 111 or a Junkers JU-88 bomber) into Ireland a short distance from his parent’s home in Kilkee around 2 am and presented himself to the authorities later that evening after he learned the authorities were making inquiries. His radio transmitter and £143 of the £300 the SD handed him were recovered in the yard of his parent’s house. 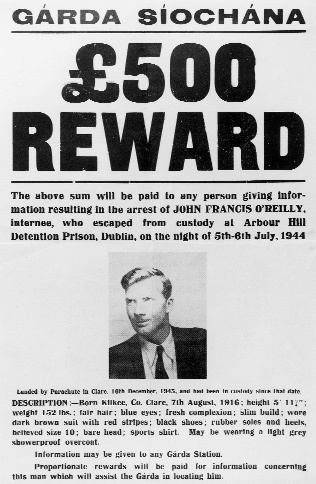 (See Terence O’Reilly’s book Hitler’s Irishmen and Anthony Kinsella’s article John Francis O’Reilly: The “Flighty Boy”). Prior to his insertion as a German spy, O’Reilly read bulletins, poetry and other content on the Nazi’s Irland-Redacktion radio service aimed at spreading pro-German and anti-British propaganda to Irish audiences. Given his quick arrest and subsequent military prison sentence, O’Reilly did not feed the Germans information on US and British army and navy activity in Northern Ireland as originally instructed. As for the Richard Harris statute, Harris won the Tivoli Cup for Racquets in Kilkee four years in a row (1948-51). I’ve tried in vain to find the location, but haven’t been successful. The frustrating bit is the Royal National Lifeboat Institution (RNLI) lifeguard station in the picture – I thought that would help. As an aside, I live in NYC and I am married to a Londoner. A few months before I met my (now) wife, her mother passed away. That I didn’t get the chance to meet my wife’s mother is my great loss – by every account she was an amazing and loving person and inspired all who knew her. She was also a supporter of good works, including the RNLI. And as a tribute to this amazing woman, I make a donation to the RNLI in her memory every year on the anniversary of her death. Total time to recognise this location: 0.05 seconds. But that’s hardly surprising as I’m from County Limerick, Ireland and most people from Limerick would be able to recognise Kilkee in less than a second. Kilkee, for most Limerick folk, is like a second home. 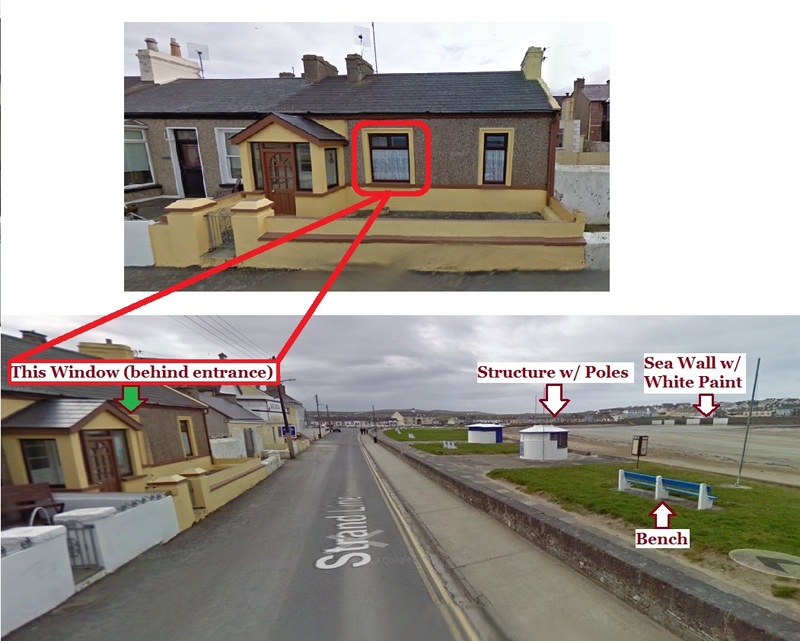 During the summer months, Kilkee becomes Little Limerick for there is scarcely a family from Limerick that doesn’t have a relative who doesn’t own or rent a mobile home (caravan or trailer) or holiday home in Kilkee where they spend the majority of their summer holidays. Personally, I’ve been going to Kilkee since before I can remember. When I was a kid, my parents used to rent a holiday home on the West End (the exact area isn’t actually captured n the photo but the white walls on the beech in the photo is an area where people play a hybrid of tennis/squash and our holiday home was just off the Dunlicky Road just behind that. It’s common for most Limerick people to leave work on a Friday evening and wish everyone well and tell them that you’ll see them on Monday, take the 70 minute trip down to Kilkee, get a bite to eat and head of to The Greyhound Bar or Fitzpatricks Pub or Scotts Bar (or any other Kilkee pub) and wind up having a drink with half of the people they’ve just wished a good weekend to at work. 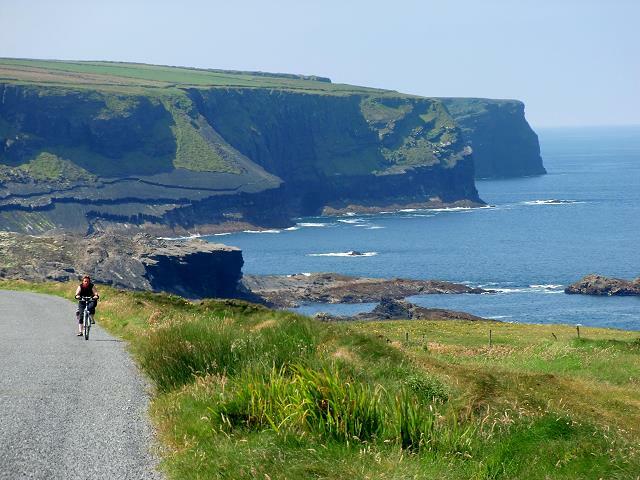 The Dunlicky Road is very well known in Kilkee and is one of the famous walking routes in the area. The walk takes you up the Dunlicky Road over towards Intrinsic Bay (not too far away from the Diving Boards) and finally over to the Pollack Holes. It’s considered one of the best natural cures for a hangover. The Pollack Holes are natural holes that have formed in the rocks that are covered by the Atlantic during high and for six months of the year, are a breeding ground for Atlantic Pollack, but during the summer months, when the tide is out, they are one of the most populated swimming spots in Kilkee. But they’re bloody freezing at the best of times! If anyone from the Dish ever decides to visit the area, I have one recommendation: bring a wetsuit! I Googled the Pollack Holes just to see what I’d get back and came across this photo of a brave man who evidently had no fear of the cold … Christ only knows how he survived. 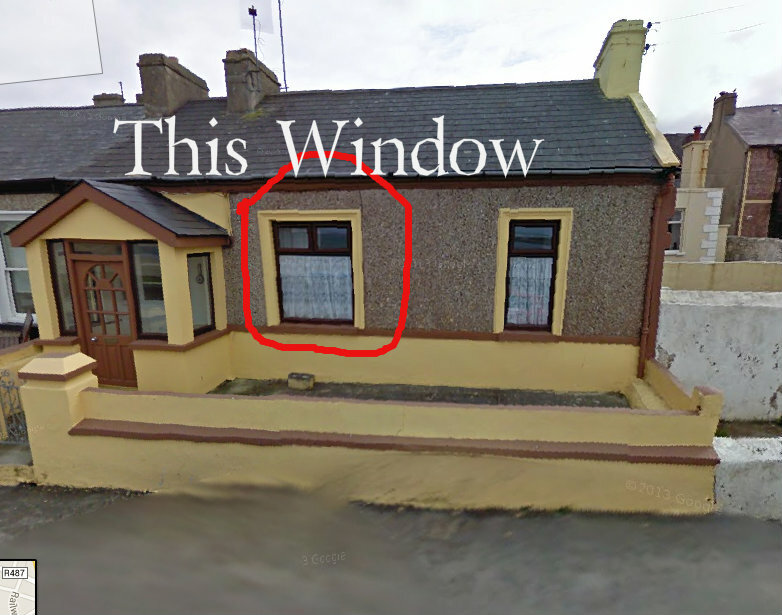 The window I found is different from the one in Google Maps, but that could be as a result of damage caused by a storm on February 12th of this year (subsequently nicknamed “Wild Wednesday”) that battered Kilkee and other locations on Ireland West Coast including Limerick City. 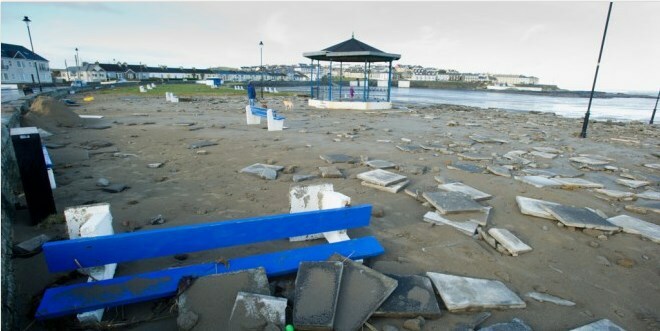 The main bandstand in Kilkee was practically destroyed and quite a bit of damage was done to the promenade on Kilkee beach, but the local town council did a fantastic job of cleaning the area up and repairing the damage in time for the annual summer pilgrimage of Limerick residents to the area. I’m therefore assuming that the new looking wall and window were recently installed. 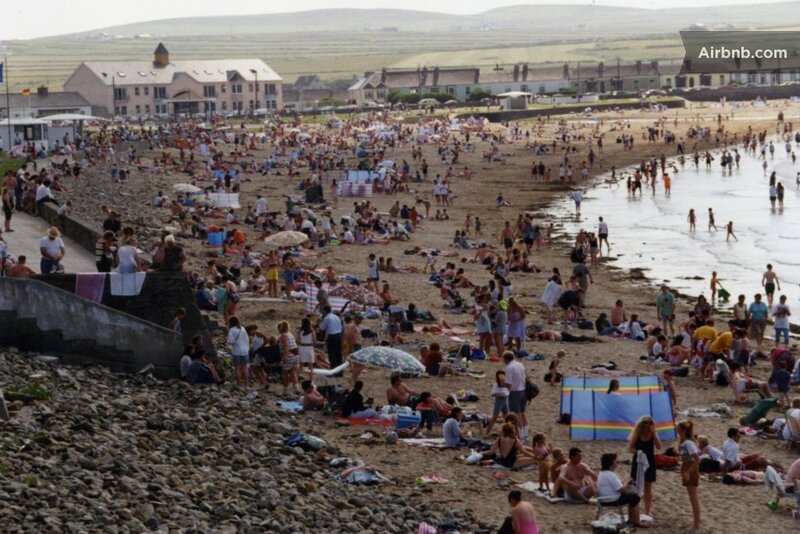 This view shows us a day at the beach in Kilkee, a resort town in County Clare, Ireland. The double yellow lines next to the curb suggested we were somewhere in the British Isles. My gut told me this was probably a seaside town in Ireland, but I ignored my gut and went on an extended detour through the beaches of the United Kingdom. Bad call. 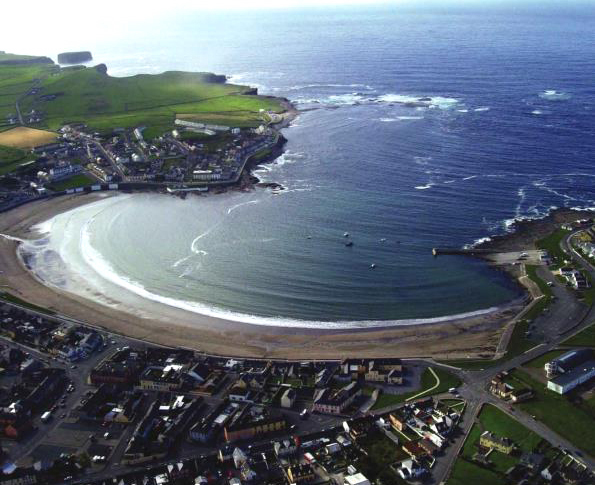 When that didn’t work, I went down a list of beaches in Ireland and found the beach in Kilkee. The view was taken from a one-story home on the Strand Line, a scenic street that runs parallel to the beach. Kilkee has a number of claims to fame, one of which is that the actor Richard Harris used to summer there. The town honored him with a statue of him playing squash, which was unveiled by Harris’ family and Russell Crowe. Also, the sea wall in the background used to host (improbably) a 20-foot mural with the iconic image of Che Guevara, which would’ve been just out of view to the left had it not been painted over last year. Guevara spent a night in Kilkee and was recognized there by the artist Jim Fitzpatrick, who went on to create the famous image. The mural was painted over after it upset some Americans who saw it and apparently left town in protest. It’s fair to say that either the statue or the now-departed mural would’ve made memorable clues. Congrats on a long-deserved victory. For everyone else, get ready for the next view Saturday! 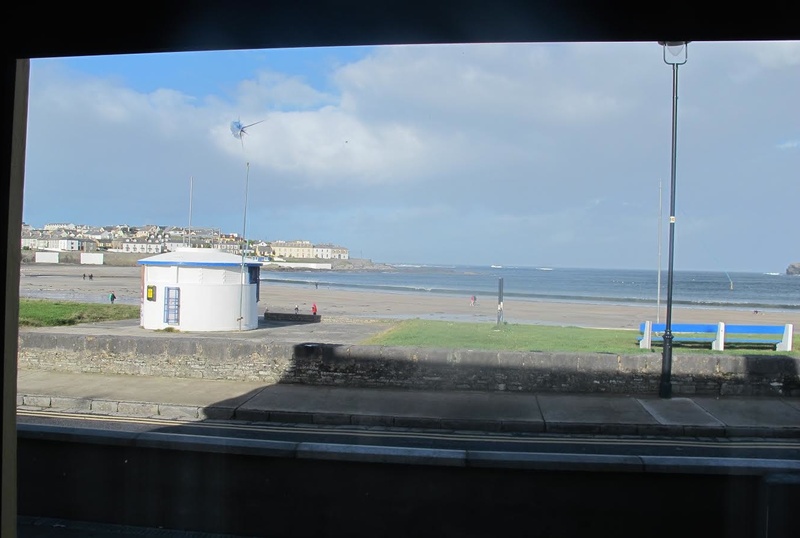 We have a “Bruce Springsteen in Kilkee” controversy! Your reader was duped by a photo supposedly showing Bruce Springsteen outside Scott’s bar in the town. This was Photoshopped. The real picture took place in New Jersey. It’s very obvious when you compare pictures which one is real. Your reader is not alone in these parts to believe Bruce visited Kilkee while he played a concert in Limerick last summer, but unfortunately there is no evidence he was ever in Kilkee.